New York state comptroller Tom DiNapoli will not conduct an audit of Gov. Andrew Cuomo’s (D.) office after it was discovered his former aide Joseph Percoco made calls from the governor’s Manhattan office while running his 2014 reelection campaign. It is illegal to use government resources for campaign purposes, and Republican gubernatorial candidate Marc Molinaro requested the audit be conducted. DiNapoli explained his rejection of the audit request in an Aug. 27 letter to Molinaro, according to the New York Post. "The circumstances prompting your request to the OSC [Office of the State Comptroller] — the disclosure of facts at Mr. Percoco’s criminal trial about his having made over 800 phone calls from state offices on 68 separate days — present factors that make it inappropriate for the OSC to commence the requested review at this time," wrote Nancy Groenwegen, counsel to the comptroller. "When conducting audits, OSC staff work to avoid interfering with ongoing criminal proceedings or other investigations," Groenwegen continued. She noted that although Percoco has been convicted, he has not been sentenced and an appeal is expected. Percoco was convicted on three corruption charges in March, including two counts of conspiracy to commit honest-services fraud via pay-to-play scams that yielded him over $300,000, according to prosecutors. Percoco, who faces up to 50 years in prison, is scheduled to be sentenced on Sept. 20, one week after New York’s gubernatorial primary. Groenwegen also wrote that a state ethics watchdog has been asked to address similar concerns over the calls Percoco made. "In addition, we are aware from published reports that the Joint Commission on Public Ethics, which has enforcement authority over violations of the state ethics laws, has been requested to examine very similar issues," she said. The former aide's lawyer insists his client didn’t talk politics on the government phone. Katherine Delgado, Molinaro’s spokeswoman, responded to the comptroller’s decision. 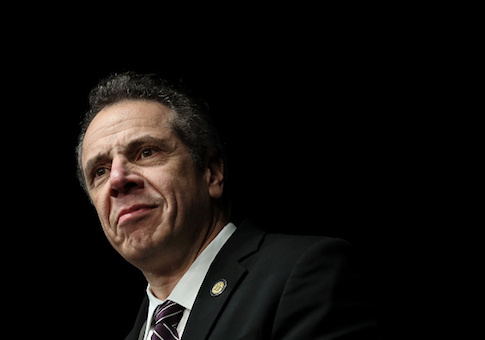 "Clearly, the Comptroller’s Office believes what everyone knows — despite his loud denials, Andrew Cuomo and his administration remain under active investigation," she said. This entry was posted in Politics and tagged Andrew Cuomo, Corruption, Marc Molinaro, New York. Bookmark the permalink.